Our facility is dedicated to the conservation of bats and ALL wildlife, and to the public education on the importance of these truly magnificent flying mammals. In 1993 , one of New Jersey’s biggest and most read periodicals, “The Record”, ran a front page story on our Curator / Lecturer Joseph D’Angeli and the life he leads as “New Jersey’s own BATMAN”. This was the first of many human interest stories on Mr. D’Angeli and the facility that he helped to create. 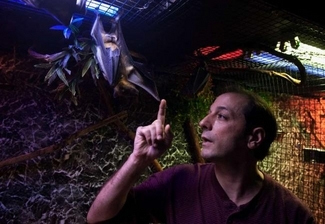 Mr. D’Angeli is a NJ state licensed Chiroptologist , and our facility is licensed to exhibit, lecture on & study live bats. 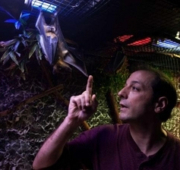 Mr. D’Angeli is also a member and former scientific advisor to the AZA’s Bat taxon advisory group (BAT TAG). Our wonderful family of bats have educated many THOUSANDS of people and have been born in our facility or generously donated from zoological institutions worldwide. We are licensed by the both the State of New Jersey Fish, Game & Wildlife, as well as the US Federal Fish & Wildlife, The USDA, and we support wildlife conservation WORLDWIDE.